When deciding which trade shows to attend, size and scope can be important factors. It’s easy to assume broad industry shows are better than niche shows because they offer more exposure. Or maybe you think niche shows are superior because they guarantee attendees who are involved in your product category. The truth is, the best type of show is one that suits your company’s objectives. Broad and niche shows have their merits, and it’s helpful to know the purposes of both before you decide which shows you’ll attend. Broad industry shows attract many exhibitors and attendees, as well as a variety of brands and product categories. This represents an excellent opportunity for PR and exposure to a greater volume of attendees. Broader shows tend to focus on marketing rather than selling, with salespeople seeking to increase brand awareness and arrange customer meetings that may lead to sales down the line. CES is a perfect example of a broad industry show, with over 4,000 companies exhibiting products across the spectrum of consumer electronics. At CES 2019, The Farnsworth Group team noticed an abundance of startups looking to sell their ideas. Additionally, we observed a wide array of smart products and questioned whether “smart” truly applied to all of them. We were impressed by the marketing efforts of big screen manufacturers like LG and Samsung, who showcased their entire brand offerings in massive displays in the Central Hall. Because of their media buzz and high traffic, broad industry shows such as CES are more useful when your company wants press for an important product launch, or when you want to pitch products to a greater volume of attendees. Additionally, broader shows are a better option if you sell products across segments that wouldn’t fit in a niche show. Niche shows usually target a specific type of trade professional. These shows are more specialized than broader shows, and pros may ask highly technical questions about your products. Attendees are genuinely interested in the product category, and there’s a calmer pace that allows for more organized interactions. Given the greater time for in-depth conversations with niche customers, these shows are less about marketing and more about selling and writing orders. AHR is a great example of a niche show. Our team spoke to many product managers with highly detailed knowledge of their products. 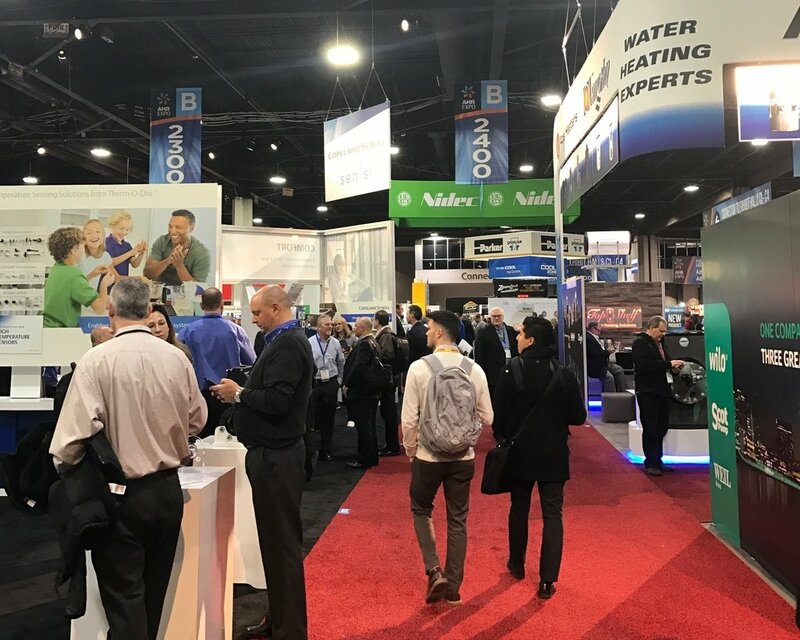 We were also reminded of the HVAC segment’s complexity at this show—a building can be heated or cooled in a variety of ways and pros across different trades install HVAC products. This show was unique in that companies highlighting technical innovation and smart products would be right next to a company selling a brass fitting. We reflected on how both types of products can be valuable and ground-breaking the HVAC segment. It’s best to attend small shows when you hope to target a certain type of professional engaged in your product category. Furthermore, small shows allow time for intimate conversations with customers, partners, and suppliers. Niche industry suppliers and distributors attending these shows often have dedicated category staff who are interested in learning more about your product. If you would like to learn more about which types of trade shows are best for your company, contact us to learn how our industry research expertise can help you make the best decision.